ColecoVision.dk presents: Billiards / Video Hustler © 1981 by: Konami Industry Co., Ltd. Initially © and Licenses: Konami Industry Co., Ltd. Note: This Cartridge contains 2 games. With an overhead view of the table, you play a billiards variant called "Pocket Ball" with just six object balls. Imprecise control over the aim and velocity of your shots. You'll discover the exicetiment of ball colliding. The silence and concentration of the billiard room, as well as the enthusiasm of the players will all be there for you. 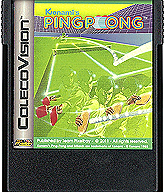 This Cartridge contains 2 games, priority is Konami's Ping-Pong. 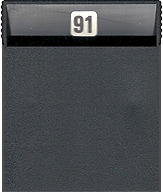 Hold down the on the keypad of player 1's controller while the ColecoVision splash screen appears. Moments later, you should see the title screen of Konami's Billiards. High Score For The ColecoVision Version Of: Konami's Billiards / Video Hustler. XName: Tom Duncan. XName: Name: Ole Nielsen. Name: Troy Whelan. Name: Name: Ole Nielsen. Name: Heather Corcoran. Name: Name: Ole Nielsen. Name: Name: Name: Ole Nielsen. ColecoVision.dk Game # 91 B, Konami's Billiards is last updated: March 24, 2019.